The Cornell Small Farms Program is pleased to announce the release of “2012 Recommendations for Strategic Investments in New York’s Small Farms”. This colorful report details the current top priorities for enhancing the viability of small farms in New York. We thank the 500 farmers, educators, and advocates around the state who participated in our initial online survey to rank emerging opportunities and the 150 who attended the Small Farms Summit, held in February, 2012, to generate specific goals for advancing these opportunities over the next 5 years. Download the report. The report can be used in any number of ways — to justify grant proposals, promote rural economic development, stimulate farmer discussion, influence policy-makers or target investment to support the viability of small farms. 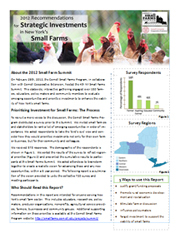 Recommendations in the report are intended for anyone serving New York’s small farm sector. This includes educators, researchers, policy makers, producer organizations, non-profits, agricultural service providers, farmers, businesses and community groups. Leading up to the Summit, we asked NY farmers, and those that support them, to fill out a survey to identify emerging opportunities that could enhance viability of small farms in NY. We asked survey participants to take the ‘bird’s eye’ view, and consider how they would prioritize investment not only for their own farm or business, but for their community and colleagues. We received 573 responses. 92% of respondents were from New York and 59% were farmers, 18% aspiring farmers, 16% educators, and 7 % community members. The following list includes the complete 16 priorities as ranked by survey respondents. Click on a priority to access an expanded summary of thoughtful comments and insights provided by survey respondents. Though not ranked among the 16 top priorities, survey respondents provided several other opportunities they considered to be high priority. View the summary of other priorities here. Matt LeRoux, Cornell Cooperative Extension of Tompkins Co.